Sometimes it's the smallest tweaks — like curling your lashes or cuffing your skinny jeans — that make the biggest difference. And who says the same rule can't apply to your digs? A quick, painless switch-up can be just the thing you need to see your favorite room in a whole new light. That's why we're pretty obsessed with these wildflower posters from IKEA. At $9 for three posters, it's a super affordable way to transform a wall (or a shelf or console table). 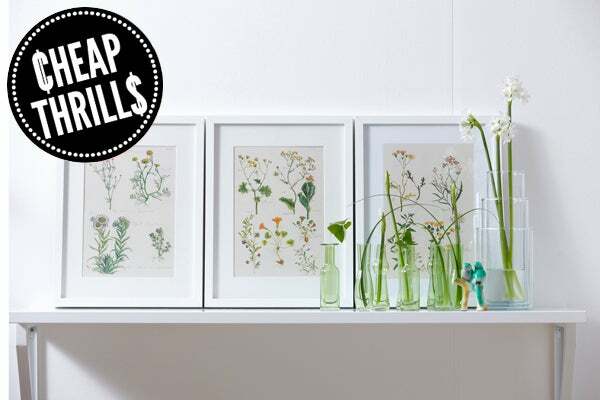 We love the vintage feel of the botanical drawings and would snap these up in a heartbeat if we spied them at a flea market. But would we be able to score 'em for less than $9? We think not. IKEA Trilling Posters, $9 for set of 3, available at IKEA, 10100 Baltimore Avenue, College Park, 301-345-6552; 2901 Potomac Mills Circle, Woodbridge, 703-494-4532.